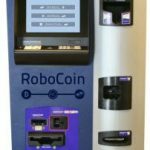 For $20,000, you can buy the “Robocoin,” a kiosk that turns dollars into “Bitcoins,” and Bitcoins into dollars. That’s about $17,000 more than a standard ATM costs. In 2009, a pizza was sold for 10,000 Bitcoins, and usage spread from there, though it’s still a very nerdy thing. You can get Bitcoins by accepting them as payment for goods and services, or by buying them from a friend, or by buying them from an exchange. Some big companies are giving it the eye, as they say.